What can municipalities do to provide access and transportation to underdeveloped slum neighborhoods which, due to their poor location in a steep hillside, cannot be reached by a regular bus system and remain disconnected to the urban core? 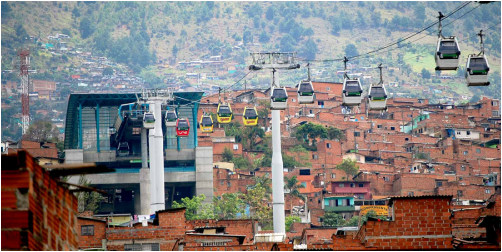 The Mayor of Medellin implemented the first Cable Propelled Transit system in South America and adopted a city plan with a focus on mobility, education and the construction of public spaces that addresses the access of poor residents to the city. For more than 3 decades the residents of the marginal Aburra Valley in Medellin were faced with the daily social and economic challenge of trying to access the rich resources of the city. Governmental officials, urban planners and neighborhood activist responded by constructing the world's first cable car system used for public transportation. Supported by a strong bureaucracy with non-corrupt finances and a public-private partner like the Metro de Medellin, the MetroCable has become one of the few profitable metro systems in the world. This permitted the city to experiment with something new and with positive results. What's provocative about the project is that, while often times you hear of a grassroots approach at life in the city, in Medellin it was top-down activism that made MetroCable possible. 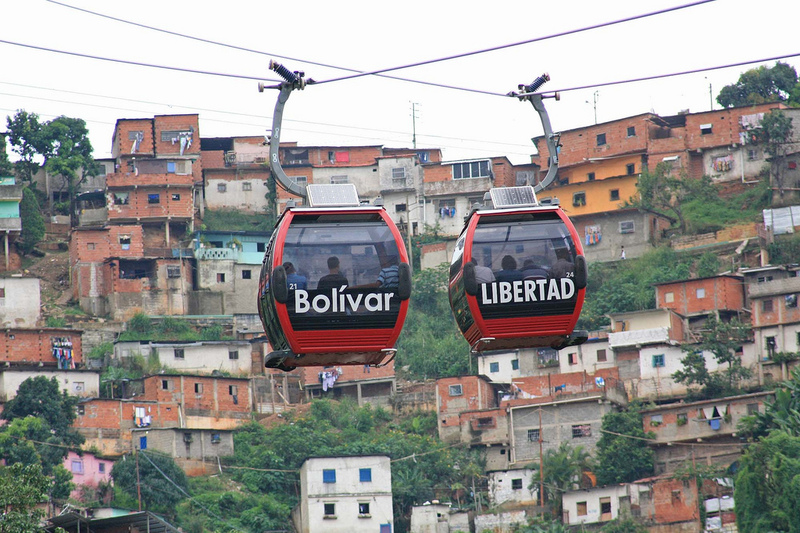 Elevated cable cars link remote informal settlements to the central metro system. What could take up to two hours on a crowded minibus now only takes seven minutes. Integral Urban Projects (Proyectos Urbanos Integrales, or PUI) focused the city’s resources on specific locations characterized by poverty and social unrest with a grand vision of providing the best public buildings and transportation system for the poorest parts of the city. There is now a greater sense of participation, and residents from the rest of the city visit Santa Domingo and other reclaimed neighborhoods for social outings. Traditionally, urban development projects focus on finding specific solutions to physical problems. Medellin opted for a different strategy: to use urban planning as a tool for social development. Social: urban integration of underdeveloped areas through holistic infrastructure and transportation systems, increased mobility of urban poor addressing spatial inequalities, doesn't require massive evictions, security. Economic: Reduced cost of travel increases economic opportunity, increase in commerce in areas around the stations. Connects poor areas of the city to the urban core with ease of implementation and design, a more integrated a complete transportation system that provides many different modes of transport, green spaces around stations. As the investment is quite low compared to other technologies, MDGs are excellent “starter” systems for cities intrigued by the technology but question its effectiveness. 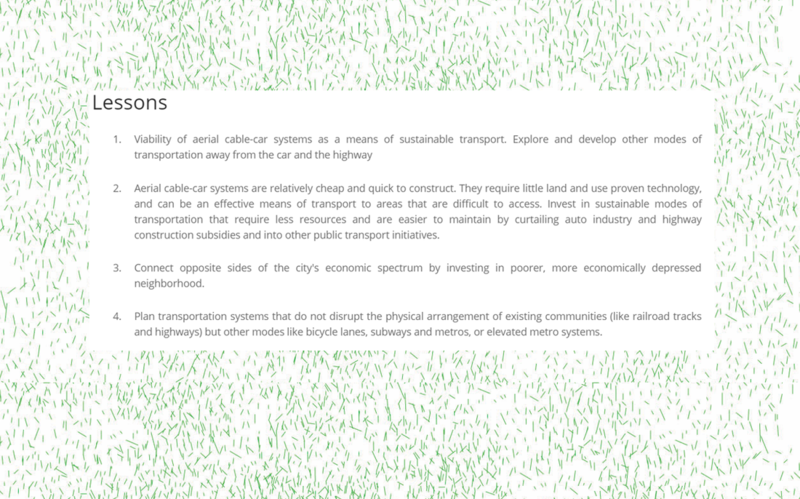 It is designed as a comprehensive strategy that seeks solutions to mobility, governance and education together with the recovery of public space and green areas. Technological barriers: since the project is unique,technical knowledge has to be constructed. Staff needs to be trained and know-how needs to be assimilated.